www.officer.com January 2016 Law Enforcement Technology 33 lips test. Repeat this test with a maga- zine filled to capacity. There shouldn't be any vertical "play" in a fully loaded magazine. The third part of the test is to dis- assemble the magazine and look at the follower. Bear in mind that some magazines were not designed to be dis- assembled. For example, the baseplates on original Colt M1911 magazines do not come off—they are welded on. One disassembles them by pushing the follower down halfway, then sticking a punch through one of the viewing holes, trapping the spring. The follower can be shaken out. AR-15 magazines and most later model handguns, including Glock, S&W M&P, Springfield XD and even the Bersa FireStorm I tested recently have a hole in their base. This is a two- piece baseplate where the smaller piece fits inside the magazine body. Hold the base of an empty magazine away from your face. Stick your Glock tool into this hole and pull the nose of the base- plate toward the nose of the magazine. The baseplate will slide completely off. Now that we have the magazine disassembled, have a look at the fol- lower. A pitted or cracked follower should be discarded. Replace it with the OEM part. The spring should be rust-free. Clean the inside of the When one slides the magazine floor plate off a Glock (and similar) magazines, there is an insert underneath. Do not reassemble using the stock Glock floorplate. 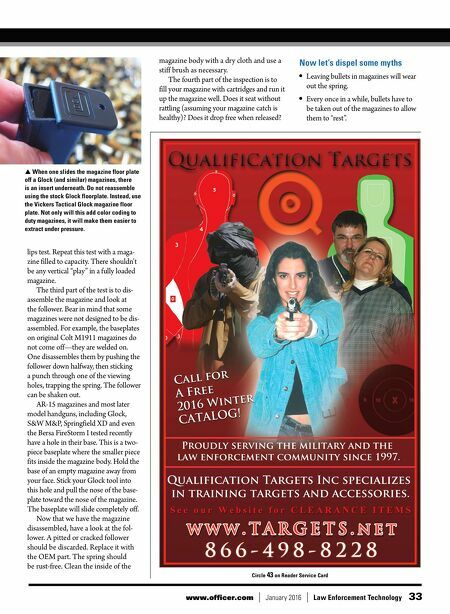 Instead, use the Vickers Tactical Glock magazine floor plate. 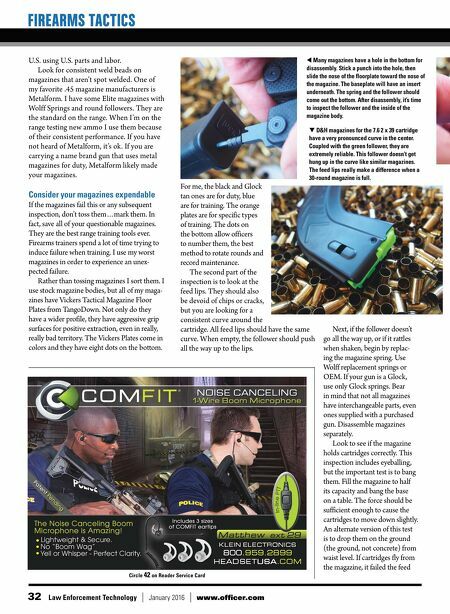 Not only will this add color coding to duty magazines, it will make them easier to extract under pressure. Circle 43 on Reader Service Card Now let's dispel some myths • Leaving bullets in magazines will wear out the spring. • Every once in a while, bullets have to be taken out of the magazines to allow them to "rest". magazine body with a dry cloth and use a stiff brush as necessary. The fourth part of the inspection is to fill your magazine with cartridges and run it up the magazine well. Does it seat without rattling (assuming your magazine catch is healthy)? Does it drop free when released?